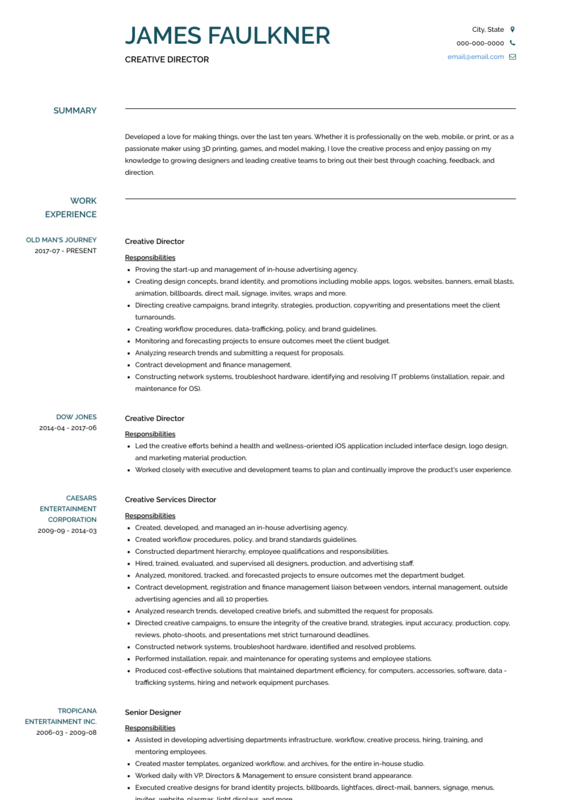 This page provides you with Creative Director resume samples that you can use for inspiration in writing your own resume, or for creating one through our easy-to-use resume builder. Below you'll find our how-to section that will guide you through each section of a Creative director resume. It’s clear that you’ve got an impenetrable creative vision with leadership skills to match, but do you have a perfectly crafted Creative Director resume to backup that expertise? With countless professionals all vying for the same industry positions, it’s essential that you stand out from the pack. Now is the time to get inspired and start building your dream career - we’ve helped over 3 million professionals, just like yourself, craft the perfect resume through our creative director resume samples. So what are you waiting for, let VisualCV help you achieve career success! Create the perfect creative vision with a reverse-chronological resume. It will allow you to quantify any big career wins straight from the outset, leaving out endless information about obvious responsibilities and duties. Go for clean and tidy presentation by using a clear font like Arial, plus big headings and lots of white space. When you’re finished, make sure you export it in the industry-standard format: PDF. This will ensure that the end result is clean and intact, ready to be viewed by industry professionals. You know the drill: selling the pitch is all about the opening statement. Allow your summary section to catch the recruiter’s attention and maintain it. Have you built an award-winning firm from the ground up, growing exponentially in employees and budgets? Do you direct multi-year contracts in excess of over $1 million. Make these career wins count. Professional Creative Director with 10 years experience leading conceptual development within medium-sized creative agency. At CircoMedia, developed pitch offerings and brand stories based on qualitative market research, leading to multi-year contracts in excess of over $1 million. Seeking to leverage expertise in retail strategies to transition to CD role at Y Company. Creative Director with lots of experience leading creative developments seeks job at X Company. Managed budgets and media spend. Our resume builder has loads of tips and examples on how to craft the perfect creative director resume. For entry-level creative director positions, use this section as an objective statement. By doing this you can outline any industry experience that’s transferable, plus emphasising your goals-oriented approach to potential hiring directors. Professional and dedicated Associate Creative Director with 5 years experience producing strong conceptual ideas for brand strategy and other channels. Proven expertise assisting on 360 degree global campaigns for international retail company. Seeking to leverage client approval ratings (98%) and multi-year contract renewable successes for a creative director role at Y Company. Associate Creative Director with lots of experience seeks to transition to role at Y Company. Not much experience leading complete 360 degree campaigns but have assisted in some projects. This is where you really get to show off your career wins. Whether you’re grossing multi-million dollar annual revenue for your boutique agency or are just assisting on your first run of brand activation projects, we can help your work history section really come through. Have you produced high-end products that have won awards and saved clients hundreds of thousands in the process? Did you use Agile workflow to drastically cut processing waste in your firm? Now is the time to highlight these achievements! List the company name, your position and the dates you worked. Then, allow your industry skills and achievements to shine through quantifiable figures. Creative Director with no experience: It’s recommended you start your career path by working as an Associate Creative Director. Through working with global toolkits, managing teams of graphic designs, copywriters and marketing strategists, you will gain front-line industry experience to boost your employability. It goes without saying that a BA in a field like graphic design, marketing or advertising as well as substantial experience will lead to a career in creative directing. An MA in Business Administration, Product Design or Multimedia Design would also benefit prospective professionals when looking for that much-needed interview. How you function on the front line is what recruiting managers really want to know. Your technical skills will showcase your tangible, job-related expertise; whereas softer skills relate to interpersonal qualities. A cover letter is a chance to convince recruiters that you’re the creative director for the job. Follow our simple tips here. What to go the extra mile? Our professional creative director resume samples (LINK) have been helping many professionals just like yourself achieve their career ambitions. Why not give it a try?